Paul, Nathan, and I all went to the lake the celebrate Paul’s grandmother’s birthday with other family members. Back in July. Yeah, that’s right. It was a few months ago, and I just realized I never posted the pictures I took! That, my friends, is Mommy Brain at its best. Better late than never, right? Also, as usual, I only posted pictures of Paul, Nathan, and myself for privacy reasons. 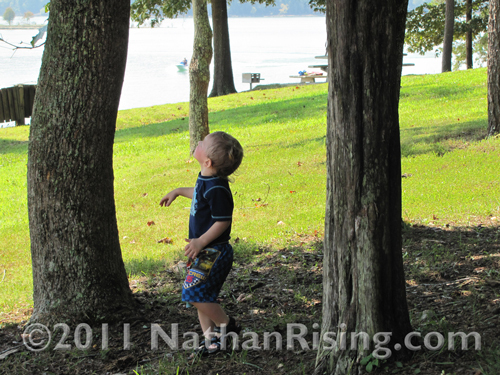 Nathan loves being outside and doing anything outdoors. 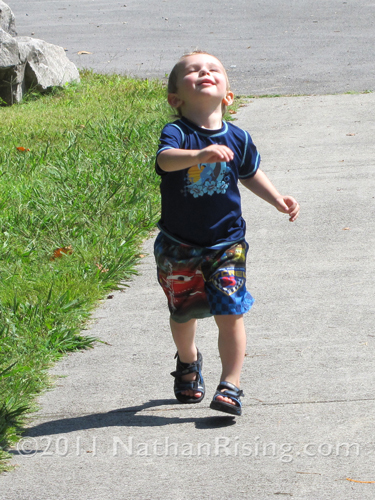 Including letting the warm sun wash over his face as he trots around with his head thrown back and his eyes closed. He ran and ran, and then when he was done with all that running, he ran some more. He ran around the entire area, exploring everything. And he is such a boy; he loves rocks. Big rocks, little rocks, smooth rocks, jagged rocks, it doesn’t matter. 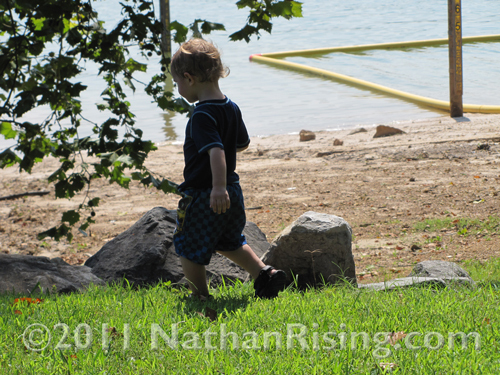 He loves them all and when he sees a rock (especially larger ones), he can’t help but check it out. He was enchanted with the height of the trees. He would run to the base of one and tilt his head as far back as his little neck would allow, admiring the height and I’m sure anticipating the day when he will actually be able to climb them. This pose looks like he’s saying, “Now wait a minute, Mommy! You can’t tell me I can’t do something!” I’m sure he was thinking that at the time. This kid loves to test everything Paul and I say… I say don’t touch, and he looks right at me and tries to touch. Of course, we are very consistent with his discipline, so Nathan is quite aware of the consequences for bad behavior. Yet he can’t help himself. He must test. It is in his very being. 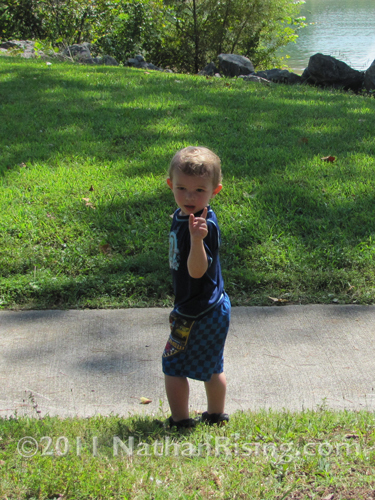 Anyway, in this picture, he was actually just talking to me and waving his little hands around. 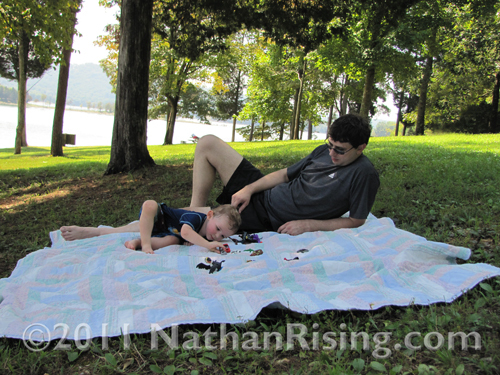 Every so often, we had to coerce Nathan into taking a break from all his running. 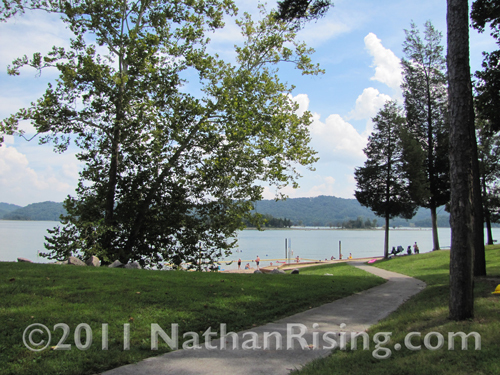 It was warm and humid that day, and Nathan was drenched in sweat. So we laid out a picnic blanket and enticed him to chill out with some of his favorite toys. I love how Paul and Nathan are laying in similar positions. My turn to get lovings from my boy! Since this picture was taken, I’ve lost about 12 more pounds. (You can’t really tell my size here because of the angle of the camera… plus Nathan is hiding my belly, hips, and thighs. Thankfully. I wouldn’t want to blind anyone.) Speaking of weight loss, as of right now, I am soooooo close to meeting my goal of making it to my ideal weight for my height. Only 13 more pounds to go! Once I reach that goal, I will have lost a total of 50 pounds. It’s so exciting to accomplish a goal you set for yourself… The secret? Willpower, willpower, willpower. Determination and the refusal to give up will get you anything, my friends. 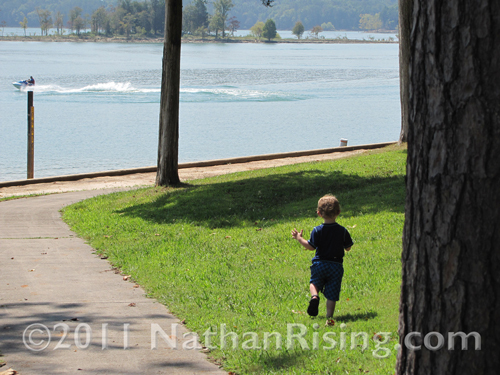 Nathan also loved watching all the boats and jet-skis zooming past. When he heard the drum of a motor, he would stop what he was doing and watch intently as the boat sped past. At one point, a plane flew by overhead. The child was completely mesmerized. It was a perfect summer day. It was humid and hot enough to remind us it was still summer, but not so much that we were all miserably roasting in our own sweat. It was a perfect day, and we all had an absolute blast. 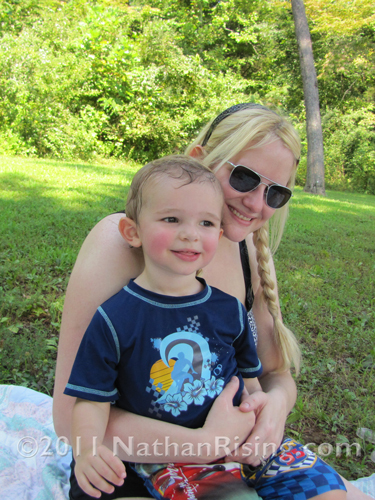 This entry was posted by Jen on October 27, 2011 at 10:48 am, and is filed under Holidays and Special Occasions. Follow any responses to this post through RSS 2.0.You can skip to the end and leave a response. Pinging is currently not allowed.